Milwaukee's M18 Jobsite Fan is powerful for its size, adaptable, portable, and it can work all day long on a charge. It will keep you cool on the jobsite, in the workshop, or anywhere you'd like a fan. Milwaukee’s M18 platform now boasts over 100 power tools. I’m not even sure I could list 100 power tools, let alone cordless ones. Despite the breadth, every tool in this impressive line is powered by the RedLithium 18V battery, which recently added a 9.0 amp hour model. Milwaukee continues to add products to this line that make the job easier or more enjoyable. On the more enjoyable side of things are products like the M18 jobsite radio. They added the Milwaukee M18 Jobsite Fan last year and we finally had the chance to put it to good use. Could the fan do its job as well as the other tools in the M18 line do theirs? The answer is…er…blowin’ in the wind and we have pretty high expectations. I eagerly opened the box as I do with any new toy. I found a stocky and sturdy fan standing about 14 inches high, 7 inches wide, and 10 inches long. It retains the same design profile as the rest of the Milwaukee line – signature red with black trim, and white lettering with the tough body material. The top of the housing is formed into a carry handle. This is similar to the way Ryobi worked with their Hybrid Fan, but fully on top of the housing. Ridgid’s Gen5X model used a flexible carry handle (all three companies are under the TTI umbrella). In all honesty, I like Ridgid’s handle better, but integrating it into the housing leaves a much lower risk of being disabled or torn off. Four keyholes and two hanging holes offer a variety of positions to temporarily hang the Milwaukee M18 Fan. You’ll also be able to direct the air flow by pivoting it around 120 degrees at 9 different stop points. I took the fan into my workshop and hung it up on the wall in about 10 seconds using a pair of drywall screws and tilted the fan cage toward the workbench with a much better attitude toward the work in front of me. It also hangs easily in the shop on our peg board. Although the real draw of this fan is the freedom from cords, it includes an AC adapter for when you’re close to a power source. There’s no appreciable difference in performance – nor would I expect there to be with such a low power draw – but of course, you’re tethered to a wall. It’s not really a big deal, but something to consider if you move about the jobsite throughout the day. The fan is part of a suite of cordless tools, so I consider the AC option a bonus feature. Still, some have criticized Milwaukee for omitting an extension cord outlet that other manufacturers have included on less expensive fans, and I think that is a fair criticism. It’s true you could plug the AC adapter into an extension cord but if you misplace the adapter, you can’t use AC power. With an extension cord outlet, there’s no adapter to lose. On the other hand, some users have been rather vocal about their desire for a charging fan. While this is a compelling idea, we’d have to get used to the idea of paying quite a bit more for that to be build in to a tool that we realistically only use for part of the year. I’d rather see Milwaukee keep the price point down and stick to charging radios. On paper, the Milwaukee M18 Jobsite Fan circulates air over 40 feet using three speeds ranging from 1,370 to 2,350 RPM. It’s capable of moving as much as 284 CFM of air to cool things down a bit. Milwaukee tells us to expect up to 17 hours of run time on low using one of their 5.0 amp hour battery packs. That all sounds great, but what does that actually translate to? The fan is sold as a bare tool, so I first grabbed a battery from my M18 Fuel Impact Driver kit, easily locked it in the fan, and fired it up. Sliding the battery in from the front means the battery fuel gauge is also on the front – a subtle but intelligent move compared to other jobsite fans. Moving the switch up to full throttle, there’s clearly a lot of power available. Three variable speeds are nice, but I’m a little surprised Milwaukee didn’t go for more flexibility between low and high. I’d like to see the next generation have even more control in the dial. How far the air reaches is a different story. Like all fans in this class, the blade diameter is pretty small, so it’s not going to move air like a 3-foot diameter blade will. Stay within 5 – 10 feet to get the most out of it. I was using a 4.0 amp hour battery pack rather than the 5.0 that Milwaukee’s run time numbers are based on. With a little math for theoretical numbers, my experience lines up with Milwaukee claims. Admittedly it’s nit-picky, but my one thing I noticed about the M18 Jobsite Fan is the noise it generates on the highest setting. Like other fans in this class, it generates some extra “whirring” over and above the air movement. On a jobsite, the worst thing it will do is alert other to the source of your comfort and bring you some unwanted company. 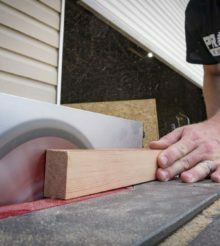 Only users used to working in a quieter setting like a home wood shop are likely to notice it much. It’s a hot, humid Florida summer and the heat is relentless. I definitely have appreciated the strong airflow in my hot garage. I’m pleased with the Milwaukee M18 Jobsite Fan. It’s powerful for its size, adaptable, portable, and it can work all day long on a charge. It will keep you cool on the jobsite, in the workshop, or anywhere you’d like a fan. If you’re already on the Milwaukee M18 platform, adding the Jobsite Fan will cost $79. If you live in an area where the temperature reached more than 80 degrees during any part of the year, you’ll be happy to have it on your side.